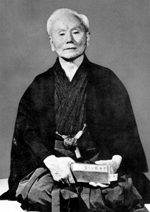 _Shotokan is a style of karate, developed from various martial arts by Gichin Funakoshi (1868–1957) and his son Gigo (Yoshitaka) Funakoshi (1906–1945). Gichin was born in Okinawa and is widely credited with popularizing karate through a series of public demonstrations, and by promoting the development of university karate clubs. Shotokan Karate is characterized by a focus on speed, fluidity and dynamic movement and the training is designed to be physically demanding so as to help its practitioners improve both their martial abilities and their physical strength while also providing development in the areas of confidence and discipline.